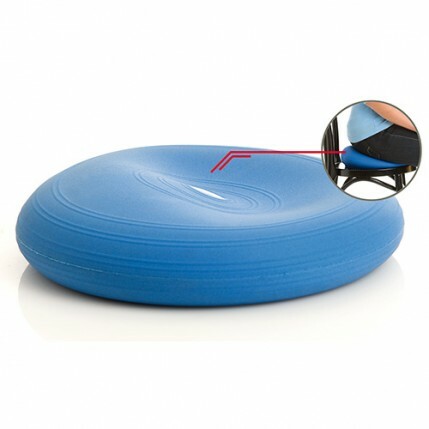 Sitting on this dynamic device makes you sit in an upright posture due to the unstable and flexible seat pad; and in turn the body tightens and your back is strengthened. Includes an exercise sheet, see the PDF. The saddle effect/shape will begin to show after ten minutes of undisrupted sitting on the cushion. After using the Happyback cushion for the first time, continue to place it in the same position each time you are sitting on it, with the saddle form on the upside. This way the saddle form will fit in an optimal way again. The saddle effect will become more pronounced with each use. Dr. Gerrit Sommer, medical practitioner, medical specialist for sports, chiropractic, naturopathy and acupuncture says: ”The happyback Ballkissen unites the most important attributes, necessary for a perfect training of back muscles through dynamic sitting". Rocker: Move your pelvis to the front side and to the back side for mobilisation of the lower spine and of the pelvis. Scale: Move your pelvis to the right side and to the left side for mobilisation of the lower spine and of the pelvic. Spinner: Circle your pelvis first clockwise several times and then change direction. Pelvic circling is ideal for mobilisation of the lower spine and of the pelvis. Aviator: Lift legs off the floor and find your balance. Balance with your arms. Stay for a short time and go down. Sit in balance and train the abdominals. Note: breathe steadily.